‘Only to taste the warmth, the light, the wind’ appears to have been the only print Cotton made of this image. It was found in the late 1990s and has been shown only once, in an exhibition at the AGNSW in 2000 where it was also used on the catalogue cover. It was unusual for Cotton to print so large, yet it is entirely fitting that this monumental head and shoulder shot of a beautiful young woman should be presented in this way. The subject was a model on a fashion shoot at which Cotton was probably assisting. 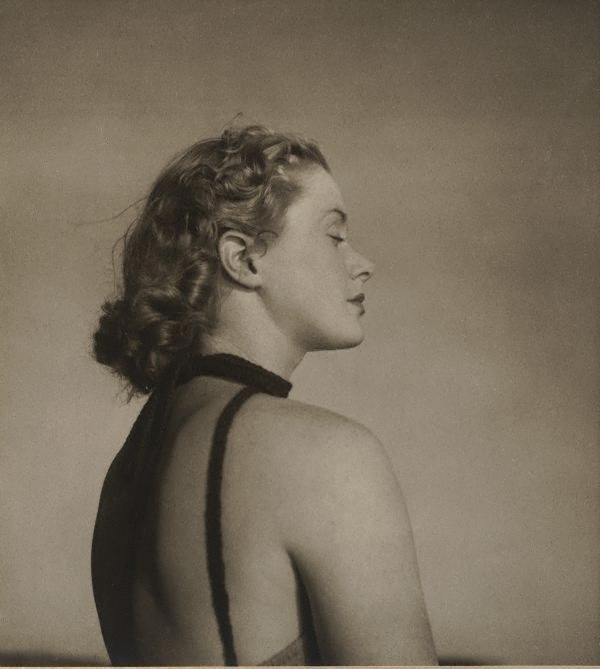 Cotton often took her own photographs while on such shoots and used them for her private portfolio. The photograph transcends portraiture, fashion and time to become a remarkable image of harmony with the elements. O summer sun, O moving trees! O cheerful human noise, O busy glittering street! A photographer whose work straddles pictorialism, modernism and documentary, Cotton maintained an independent vision throughout her working life, based on the close observation of nature. Her understanding of the medium of photography was not to do with capture, but rather ‘drawing with light’. Signed l.r. mount, pencil "Olive Cotton". Not dated. Judy Annear, Photography: Art Gallery of New South Wales Collection , 'The photograph and portraiture', pg.15-31, Sydney, 2007, 17 (illus. ), 28 (illus.). Olive Cotton , Sydney, 2000, cover (illus. ), 64 (illus.). The photograph and Australia , Sydney, Jun 2015, 103 (colour illus. ).